Nerf Fall 2014 announcement incoming! The Nerf Zombiestrike Fusefire. Picked it up at Target for $19.99. Includes 5 discs. Not included are 3 AAA batteries that work the light-up function on the blaster. 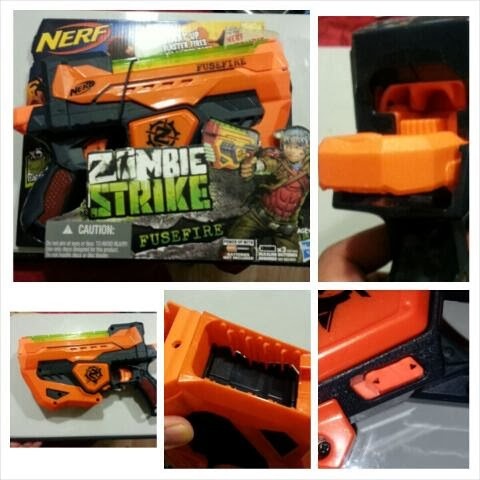 Have found the entire wave of early-2014 blasters at the Target on Larrabee, concurrent with their site saying that it's in stock finally; said site is probably accurate with regards to the other Chicago Targets, have yet to check other retailers as they are less convenient to get to. Am doubtful that the TRU on Western has anything new, as their stock checker was inaccurate with other things a couple months ago and they barely had any of the newer stuff then.